There are separate hostels for boys and girls and equipped with like washing machine, Wi-Fi for free and food facility is also available inside the hostel, but hostel is not available inside the hostel but college are having bus facility and they will pick-up and drop you form the college to hostel and shopping mall, park, hospitals all these things will get within 200 M from the hostel. I am very happy with this college because for batter education this college is providing some extra programs also like soft skill training, time management skills program, leadership and co-ordination skill, business communication skills etc. 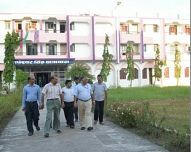 this college mainly focus on education and college are having modern library, hostel for girls and boys. RCM Bangalore is mainly focus on practical knowledge as well as business and management practices. The college organize lots of events and presentations, activities on corporate seminars, workshops etc. and the college organized many co-curricular activities like music, dance, art, sports and team building activities according to me its good college. Are you Interested in " Regional Institute of Co-Operative Management"? Please provide the following details.